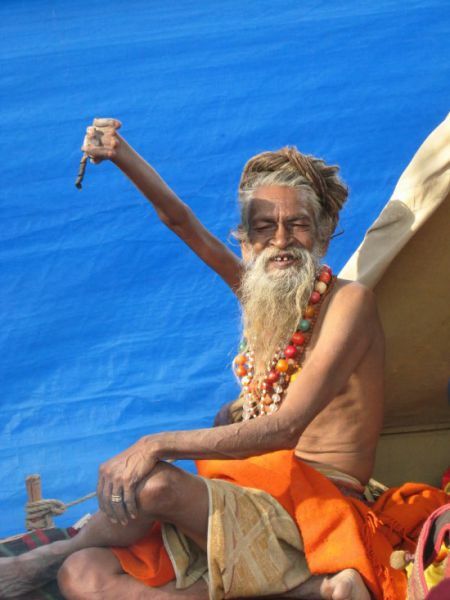 Meet Sadhu Amar Bharati a man who has kept his arm lifted for over 38 years. I don't know about you, but I can't imagine holding my arm up for 5 mins let alone 38 years! Sadhu used to be a normal man with a wife, children, and a normal life whatever that might mean. Then one day he woke up and realized that he was wasting his life and should devote his life to Shiva, the Hindu god. He is a symbol of holiness to all Shiva worshippers. He began by wandering India in simple Sadhu clothes and carrying a trident called a Trishula. After three years he realized was still not dedicating his life in total to Shiva. That is when he decided to raise his right arm and keep it raised. It has been 38 years now and he couldn’t use his arm even if he wanted to. From holding it up that long his arm has atrophied and is stuck in a bizarre position. He doesn’t clip his fingernails either, so they stick out in odd shapes and forms as well. Learn Something Fun: Who is SHIVA? Shiva, the god of destruction and regeneration in the Hindu pantheon, has many forms including Shiva as a meditating ascetic, Nataraj - Lord of the Dance, Bhairav - Shiva in his wrathful aspect, the androgynous Ardhanari - half man, half woman, and in various forms with his consort Parvati/Uma/Durga/Kali. He usually holds a trident and a small drum, and the divine bull, Nandi, serves as his vehicle. He is the father of Ganesh. It is amazing for someone to feel so strongly in something, it just does not seem like something with purpose.